Written by: Francis Manapul, Brian Buccellato; Art and cover by: Francis Manapul. Note: This is the conclusion of a three-part story guest-starring the Flash and Swamp Thing. Something is very wrong with Red Robin…and he’s about to prove it! Can the rest of the Titans stop this tragedy? Or is it already too late? Written by: Scott Lobdell; Art by: Eddy Barrows; Eber Ferreira; Cover by: Eddy Barrows, Eber Ferreira. This entry was posted in Out This Week on June 26, 2013 by Kelson. Yeah!! What’s up with that, lately?!? No Flash in Justice League!??! I have pretty much stopped reading Justice League due to this! 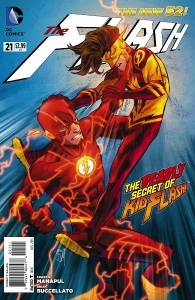 I cannot wait for your review of Flash #21, Kelson – it’s safe to say, not my favourite. I hope Ed’s review is sufficient. I haven’t reviewed an issue of the series in a long time.